I'm so excited to share that I'll be hosting nine (yes, NINE!) 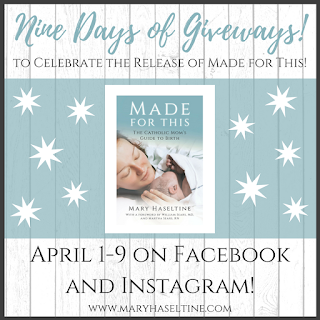 days of giveaways to celebrate the Made for This book release! You guys, this stuff is GOOD. The total retail value of all of it is over $500!! Don't miss it! And PLEASE take some time to visit each of these talented artists and generous donors! A hand-lettered greeting card and goods shop with beautiful affirmation cards she makes specifically for labor and birth! Hand-drawn personalized home goods including nursery pillows! Handcrafted and sewn clothing for babies, children, and women. Each item is lovingly made with the most high quality fabric, in the cutest patterns you'll see. Most are organic, so that your loved ones will be wrapped in the softest, most comfortable clothes they deserve. Effective and safe cleaning products without powerful chemicals (which makes them PERFECT for use in a home with children)! Known for their colorful silicone baby rosaries and nursing necklaces, Chews Life also has beautiful Mama rosary bracelets and jewelry perfect for bringing the beauty and faith into motherhood and babyhood. Melody is Catholic aromatherapist with a particular interest in empowering parents to become healers in their own homes. A former skeptic of natural wellness, she now believes that the Catholic application of faith and reason leads us first to God's natural gifts for healing mind, body, and soul. Custom hand-crocheted items for baby, children, and mom including rosary teethers and nursing necklaces! Hand painted wooden saint peg dolls including keychains and a variety of Marian dolls! Embroidered goods and diffuser jewelry featuring customized mother's nest necklaces and hoops! A whimsical little shop celebrating childhood and fun, specializing in hand painted wall art. Beautiful hand crafted and customized rosary and saint bracelets to help you pray including bracelets specifically for labor and birth! Unique hand-crafted gifts tailored to your special someone featuring baby loveys and blankets, customized birth announcement keepsakes, and so much more! The Koala Mom is a blog about everyday life as a mom, marriage, books and reading, homeschooling, great products for families, and tips and advice for parents. Creators of silicone teething rosaries and other faith based children's items to bring the faith into little one's hands from the tiniest age. A blog passionate about pursuing healthy living and holiness in the domestic church. 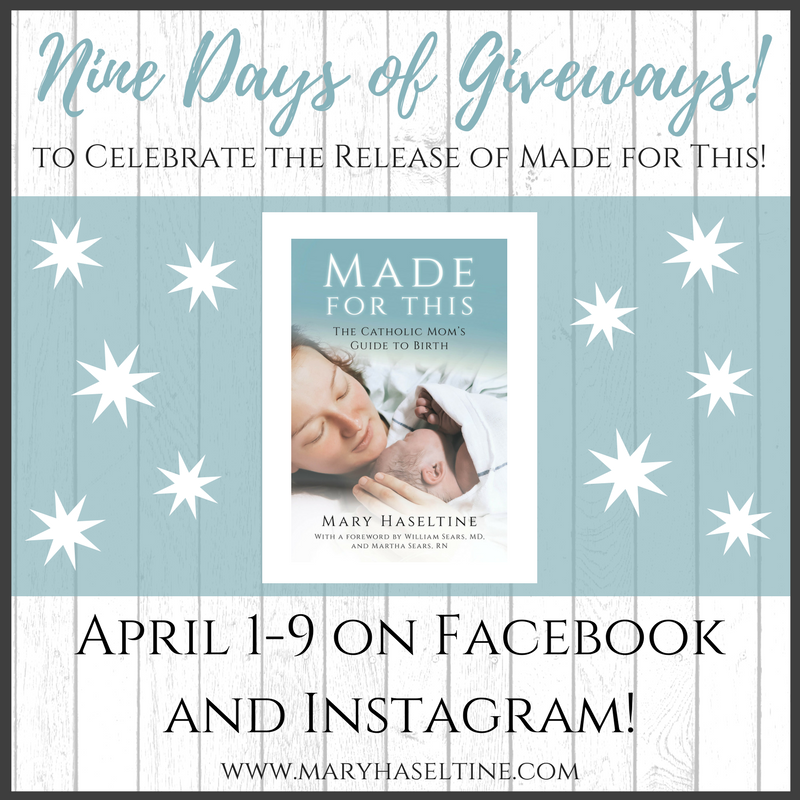 She posts twice a week on natural living, including weekly natural birth stories from other moms. A blog on Catholic motherhood, gifted/2E parenting, and homeschooling filled with resources, printables, and e-books. Theresa is a homeschooling Catholic mom of five whose crochet and sewing work is absolutely beautiful! She specializes in custom baby toys, teethers, bunnies, and bibs but there's always something new she is trying! Each item is one of a kind and made with quality. Most of her items are now sold through Instagram. Products that help you remember to practice joy with a huge variety of custom decor, handcrafted jewelry, a men's collection, and sacrament gifts. A blog about Catholicism, children, culture, and work-outside-the-home motherhood. Wall art, prints, and other items featuring prayers, quotes, and customized images for your special occasion, including Baptism, Confirmation, Communion, and nursery decor. Hand lettered artwork and beautiful faith-filled fashion jewelry featuring prints, pendant necklaces, rosary bracelets, mugs, and more. Effective and safe cleaning and personal products without powerful chemicals for a healthy home, body, and baby! Wall art printables that aim to serve as beautiful visual reminders that will inspire a deepening of the Catholic faith in our everyday live. All profits go directly toward helping their family grow through adoption!